Yes, you read the scoreline right! Liverpool could not have asked for a better first leg at the Anfield. Jurgen Klopp's side produced an outstanding display in front of their fans as they comfortably beat Pep Guardiola's City who have completely dominated the league. 0 - Manchester City failed to direct a single shot on target in a game for the first time since 26th October 2016 (v Man Utd in the League Cup). Blunt. This was the first all English Champions league tie in seven years and who else other than Mohamed Salah to break the deadlock in such a mouth-watering clash. He capitalised on Kyle Walker's mistake and smashed the ball from inside the box early on in the game. Nine minutes later, the former Arsenal player, Alex Oxlade-Chamberlain doubled The Reds lead with a terrific goal right from the edge of the area as he saw the ball go right past Ederson and into the back of the net. By this time, the fans at the ground were signing at the top of their voice. 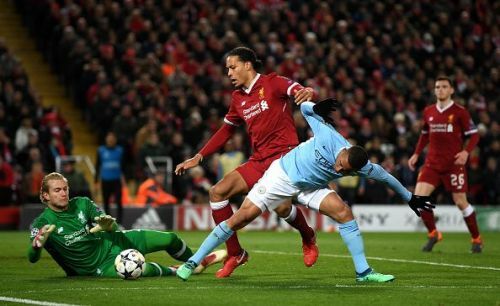 If a two-goal lead in by the 21st minute was not enough, Sadio Mane made City's night even worse at the half-hour mark as he headed in a perfect cross from Salah. The Reds would go into the second leg full of confidence but would also be aware that there is still 90 minutes to play and things can turn around quickly. The only negative for Liverpool would be that of Salah's injury concern who was taken off and Henderson, as he would miss the game at the Etihad after picking up a yellow card tonight. Honestly, Ederson was just exposed and really couldn't do much about it but pick the ball from the back of his net thrice in the first half. A night to forget for Walker. He was all over the place in the game. Walker was also responsible for the opening goal as he failed to clear his lines which Salah used to his advantage. This game proved that Kompany is just not the same old Kompany. He failed to keep up with Liverpool's pace in the game. He looked uncomfortable and was out of position all three times when the home team scored. With his passes not going right, his decisions also seemed to take a hit. He lost possession which led to his side conceding the third goal of the night. Salah took Laporte for a ride as the latter appeared to be terrified to be up against the Egyptian. He also did not provide any width while going forward. His last game as a left-back? Found it hard to get on the ball and make a positive impact for his side. With Liverpool's high pressing, City found it difficult to settle down in the first half and Fernandinho could hardly do anything about it. Silva failed to make an impression on the game tonight. He had a rather quiet game and could be his worst performance in City. Just like Silva, De Bruyne also failed to influence the game as he hardly ever got on the ball. He was completely overrun in the first half. A surprise selection with expecting Sterling to be chosen before him. While on the pitch for 56 minutes, Gundogan did not provide any support to his team. He provided no support, no cover nor any contribution whatsoever. Probably City's most involved player but yet did not make the most of it. He made a mess off the final ball and poor decision makings got the better of him. He hardly touched the ball in the game and was never supported by his teammates tonight. However, he did very little to change that and was left standing in the front alone. Coming on for Gundogan, Pep would have hoped for some magic from him, but like others, he also failed to dictate the game.